It’s voice activated! It plays music on demand! It lets me control my Hue lights without touching anything! It hardly needs an introduction, the way Amazon’s been advertising it. Amazon Echo is an interactive voice-controlled hub that can do a lot of things, like look up information, play music, and control other home automation systems you might have. It’s always doing more, too, because Amazon rolls out regular updates. Here are the things I mostly use it for (but there are way, way more things it can do than this). This 30 second clip by Amazon shows it in action. It understands me better than I expected, despite my usual struggles with voice-interactive technology. There’s even a “Voice Training” section in the app for fine-tuning its ability to understand you. Limited capabilities with home automation systems: once you want to go beyond on/off, there isn’t as much you can do. IFTTT support? Doesn’t work with Spotify or iTunes (yet? ): alas, that’s where I get my music from (and in the case of iTunes, I’m pretty entrenched with 10 years worth of playlists and music purchases). You can pair with your phone over Bluetooth to get access to these services, but it’s not built-in to Echo. TL;DR: It’s great! If you love tech toys you’ll love it. I you can find it on one of Amazon’s occasional promotions for $149 grab it, it’s worth it. I’ve had my Echo for nearly two months now and I’m still discovering new tricks and learning new routines to use with it. This isn’t a piece of technology you set up once and forget – Amazon is keeps adding new abilities to the Echo, and to get the most of it you’ll want to stay current on what it can do. You won’t learn (and make habit of) everything it can do in an afternoon. 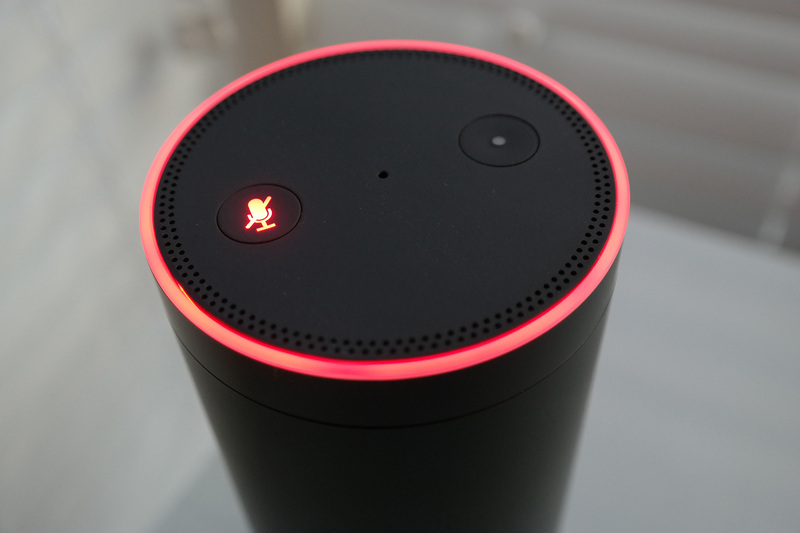 The blue ring lights up in response to you saying, “Alexa…” to indicate the device heard you. It’s just easy to use, simple as that. The setup was fast and controlling it with my voice is a snap. Judging by many of the earlier reviews of the Echo online, it has an enthusiastic following among people with disabilities and/or limited mobility and I can see why. The Echo has significantly reduced how often I have to flick switches and fumble around in the dark for a light switch or my phone. I don’t have to walk across a room or lean over a table or perform any potentially tricky maneuvers to operate light switches, and I never have to walk around in the dark. 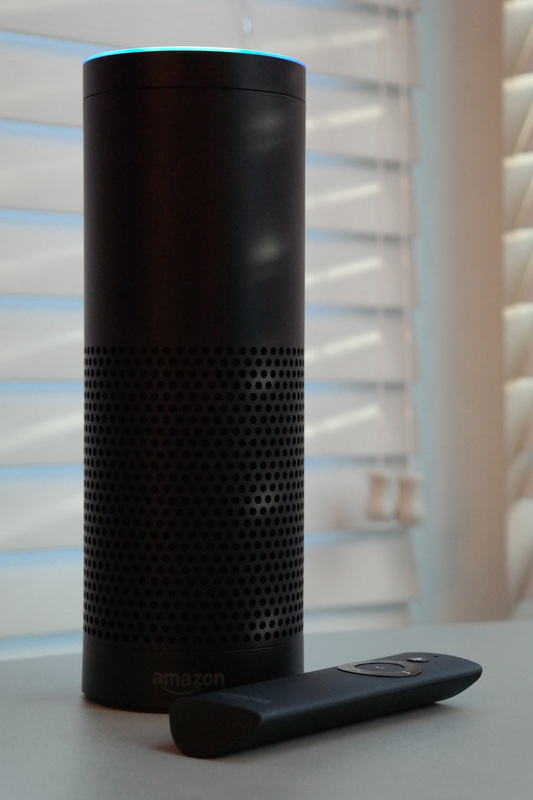 I was initially hesitant to bring home an Amazon Echo because I’ve had a not-insignificant amount of trouble with voice-navigated stuff in the past. I’ve struggled with phone menus, Siri, and speech to text to the point that my attitude towards all things voice-activated is closer to, “Ehh, f— it” than anything else at this point in my life. For anyone wanting more info on my “accent”: I grew up west of Chicago (as did my parents) and my upbringing was in English. I am female, but no one’s accused me of having a high-pitched voice. My friends here in Seattle tell me I have a slight accent. Alexa understands me about 80% of the time, and (if Alexa’s history is any indication) the most common misunderstandings are song titles, which are (often) outside normal speaking patterns anyway. So, yeah, I’m impressed on this front. I don’t know how reliable it is with other accents, but I’ve been surprised at its accuracy with mine. Hands-free control of my Philips Hue lights (link to my review) was probably the biggest reason I got an Echo. Setup was easy: just say, “Alexa, discover my devices” and hit the button on the Hue bridge. It was easy to group my lightbulbs into a single group (named “lights”) via the Alexa app. 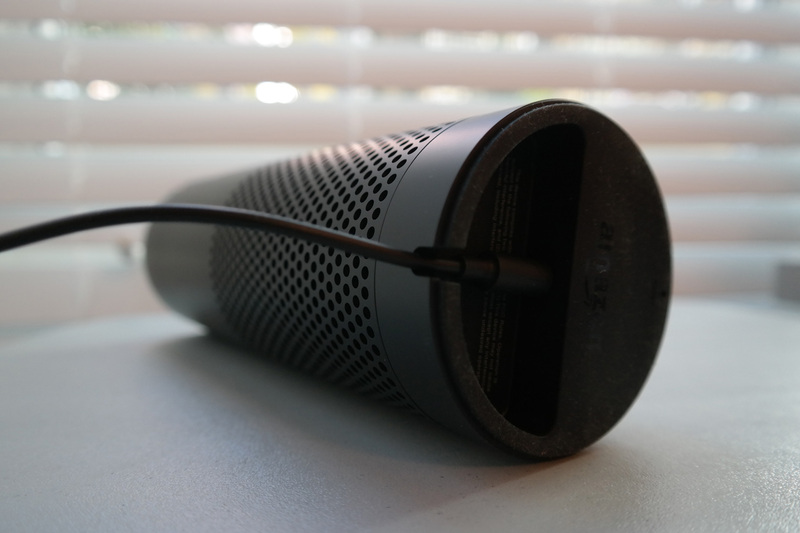 Traditionally, I did (or do) most of my idle music listening through my portable Bose Mini speaker, and the Amazon Echo is definitely not as good a speaker. The weaker bass is the most noticeable difference. However, as soon as I set up a couple playlists on Amazon Music I found myself using my Amazon Echo for music more than I thought I would. “Alexa, play Sleepy Time playlist” is so easy, and I can follow that up with a sleep timer, “Alexa, set a sleep timer for 45 minutes” so that it shuts off sometime after I fall asleep. I find myself starting and stopping music all the time, and it’s definitely more convnient than opening my app, turning on the Bose, and selecting the playlist I want. Just press the mic button on top of the device. I found this out when I got a phone call while my Echo was busy DJing. I had to mute the Echo quickly and without saying, “Alexa, stop” into my phone call. Shhh, Alexa. Glad I could shush you without having to issue a vocal command. The “Alexa” companion app (available on iOS and Android) is polished and fully featured. Nearly everything you can do over voice you can do or access through the app. The app also keeps a history of every command you’ve given it. In this history, you can mark whether a command was properly understood by Alexa. Presumably, Amazon will collect all this data, swizzle it around in a big data vat, and use it to further improve Alexa’s voice recognition. 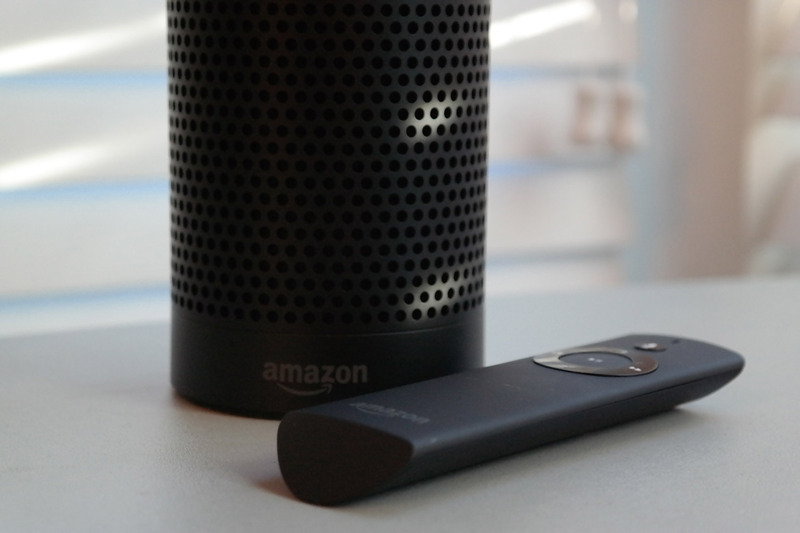 The optional Echo remote is also very useful, allowing you to issue commands quietly and from places the Echo wouldn’t normally be able to hear you. Just hold the mic button and speak into it (you don’t even have to use the wake word). You can also use the remote buttons to raise and lower the volume, pause the currently playing song, and navigate backwards and forwards in a playlist. The remote comes with a magnetic mount, so you can keep it tucked away somewhere convenient. 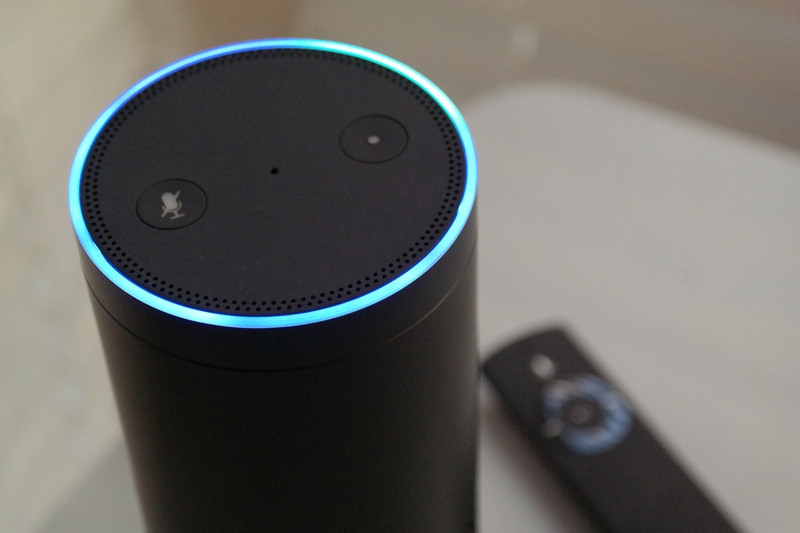 The Amazon Echo remote is sold separately, but was worth the extra cost. I keep mine near my bed. 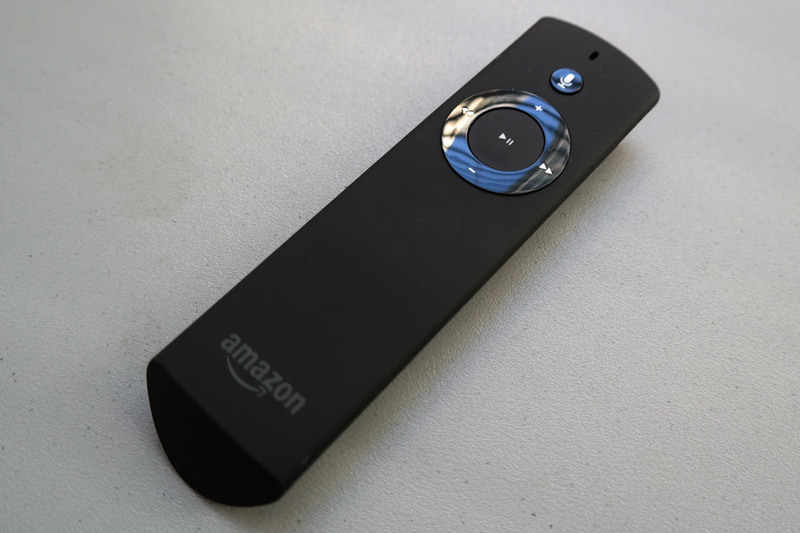 The only downside to the remote is you can only have one per Echo (but maybe Amazon will change that someday). What’s the bottom of the Echo look like? It’s flat, rubbery, and has a cut-away for the power cable. The bottom makes a nice grip on most surfaces, but it has a tendency to collect lint. My first Echo arrived dented! Boo, hiss. This unit also seemed to have problems identifying what direction my voice was coming from. On the bright side, Amazon shipped me a replacement within a day of requesting a return. However, Amazon shipped me a new one immediately (with 1-day shipping!) before I even sent back my first one. The seamless transition from my dented Echo to my replacement Echo was great and went a long way to easing my annoyance. 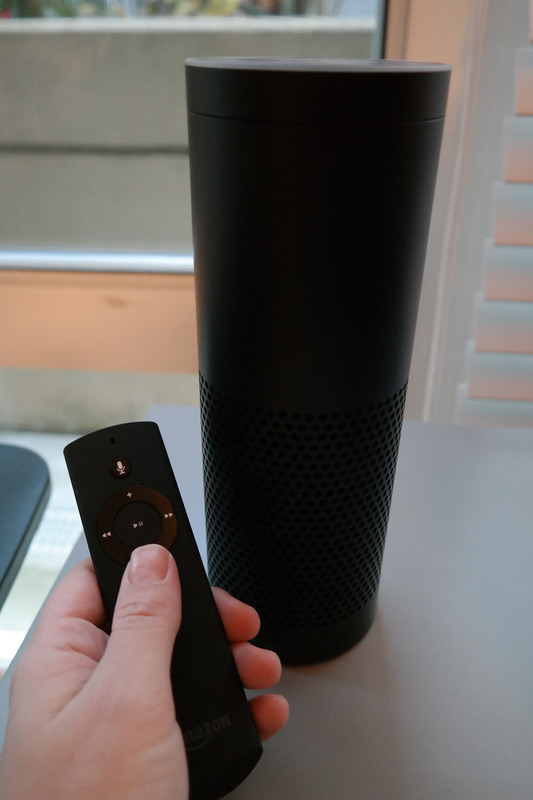 When I first unboxed my Echo I didn’t know I could twist the top ring on the hardware to lower the volume. I ended up trying to wrap towels around it to survive the setup process and lower the volume the only way I knew how with, “Alexa, turn it down”. I don’t know why Amazon even lets an Echo use the max volume during setup. In the grand scheme of things this isn’t a huge flaw, but it made a very poor first impression. My neighbors would have been right to bust down my door and throw the Echo through the nearest window. There are a lot of good things to say about Amazon Prime Music. I like the already-created playlists (so you don’t have to scramble to assemble a Christmas playlist one hour before your party), no ads, unlimited song skips, and no apparent restrictions on when you can play what. Sweet! If you already have Prime, you have Prime music, so that’s nice, too. I had to put in a bit of work upfront to download Amazon Music application onto my PC, upload songs I’ve already paid for because I bought them on iTunes (thank goodness these could be uploaded without DRM grief or I’d be pretty mad), and build them into new Amazon Music-based playlists. Once I did that setup work, though, I could then tell my Echo to play those playlists by name, which is super awesome and works great once it’s all set up. I can’t get “Buy this album” to work on my Echo at all. I can preview an album, but there’s something wrong with my Amazon billing info (which works for everything else I buy on Amazon and has One-Click shopping enabled), but neither Alexa nor Amazon’s billing interface can tell me what the problem is. At this point I’ve sunk enough time into trying to decipher the root cause and I’ve given up on making purchases through Echo for now, which is too bad because I think Amazon was hoping I would buy a lot of things through my Echo. Mostly because I’m vain and want to personalize it. But also: I might be the only person on Earth who regularly Skype-chats with another Echo owner, and it does start to get old after I turn off my friend’s lights on accident through video chat (haha). More sophisticated control over my home automation systems. I’d like to say “Alexa, I’m leaving” (or some equivalent) and have her do a number of things at once: stop playing music, turn Hue lights to off, and turn my WeMo device off. The Echo is awesome, and I think we’re only at the beginning in terms of what this device will someday be capable of. Don’t let my bad experiences with a dent and not finding my eclectic weirdo music in Amazon Prime get you down, it’s absolutely worth its price. It’s a ton of fun to play around with in the first few weeks, and the usefulness only improves as you learn more commands for it and add supported home automation systems. If you have Hue lights, WeMo switches, or any of the other numerous systems Echo intergrates with, you’ll love controlling everything by voice. If you love doing anything with music in the background, you’ll love the ease of starting up a playlist by voice. If you have mobility limitations or an awkward home layout, you might find the Echo plus a few smart home devices makes routine tasks a lot easier. I suspect I’ve still got more to discover about my Amazon Echo, and I’m looking forward to it. Should you get it? If you’ve got Prime and a love for current technology, I say go for it, especially if you catch it on discount (Amazon occasionally drops the price to $150).